This past Thursday, we held our fourth webinar, and the topic was how to incorporate 3rd party native libraries into a Codename One app. I used the recently released FreshDesk cn1lib as a case study for this webinar. As the topic is a little involved, I decided to break it up into two webinars. In part one, we focused on the public API and architecture involved in developing a wrapper for a native SDK, and walked through the native implementation for Android. In part 2, scheduled for Thursday October 8th, we’ll show how to implement the iOS side of the library. For those of you who prefer written tutorials, I will be publishing a parallel 3-part series on this topic in the blog. The first part of the tutorial is contained in the remainder of this blog post. The following is a description of the procedure that was used to create the Codename One FreshDesk library. This process can be easily adapted to wrap any native SDK on Android and iOS. Before we begin, we’ll need to review the Android and iOS SDKs. What should my Codename One FreshDesk API look like? What will be involved in integrating the native SDK in my app or lib? When designing the Codename One API, I often begin by looking at the Javadocs for the native Android SDK. If the class hierarchy doesn’t look too elaborate, I may decide model my Codename One public API fairly closely on the Android API. On the other hand, if I only need a small part of the SDK’s functionality, I may choose to create my abstractions around just the functionality that I need. In the case of the FreshDesk SDK, it looks like most of the functionality is handled by one central class Mobihelp, with a few other POJO classes for passing data to and from the service. This is a good candidate for a comprehensive Codename One API. Before proceeding, we also need to look at the iOS API to see if there are any features that aren’t included. While naming conventions in the iOS API are a little different than those in the Android API, it looks like they are functionally the same. Therefore, I choose to create a class hierarchy and API that closely mirrors the Android SDK. Public Java API, consisting of pure Java classes that are intended to be used by the outside world. Native Interface(s). The Native Interface(s) act as a conduit for the public Java API to communicate to the native SDK. Parameters in native interface methods are limited to primitive types, arrays of primitive types, and Strings, as are return values. Native code. Each platform must include an implementation of the Native Interface(s). These implementations are written in the native language of the platform (e.g. Java for Android, and Objective-C for iOS). Native dependencies. Any 3rd party libraries required for the native code to work, need to be included for each platform. On android, this may mean bundling .jar files, .aar files, or .andlib files. On iOS, this may mean bundling .h files, .a files, and .bundle files. Build hints. Some libraries will require you to add some extra build hints to your project. E.g. On Android you may need to add permissions to the manifest, or define services in the <Application> section of the manifest. On iOS, this may mean specifying additional core frameworks for inclusion, or adding build flags for compilation. The public API consists of the main class (Mobihelp), and a few supporting classes (FeedbackRequest, FeedbackType, MobihelpConfig, MobihelpCallbackStatus), which were copied almost directly from the Android SDK. 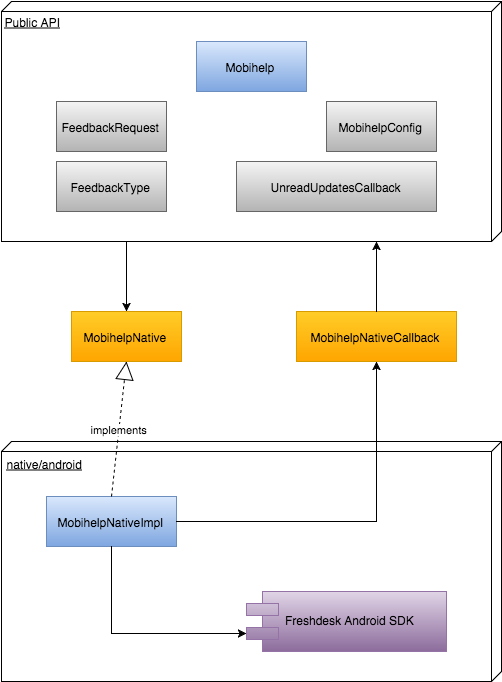 The only way for the public API to communicate with the native SDK is via the MobihelpNative interface. We introduced the MobihelpNativeCallback class to facilitate native code calling back into the public API. This was necessary for a few methods that used asynchronous callbacks. We have already looked at the final product of the public API in the previous step, but let’s back up and walk through the process step-by-step. I wanted to model my API closely around the Android API, and the central class that includes all of the functionality of the SDK is the com.freshdesk.mobihelp.Mobihelp class, so we begin there. We’ll start by creating our own package (com.codename1.freshdesk) and our own Mobihelp class inside it. In a first glance at the com.freshdesk.mobihelp.Mobihelp API we see that many of the methods take a parameter of type android.content.Context. This class is part of the core Android SDK, and will not be accessible to any pure Codename One APIs. Therefore, our public API cannot include any such references. Luckily, we’ll be able to access a suitable context in the native layer, so we’ll just omit this parameter from our public API, and inject them in our native implementation. Hence, the method signature public static final void setUserFullName (Context context, String name) will simply become public static final void setUserFullName (String name) in our public API. We’ve already decided to just omit the Context parameter in our API, so that’s a non-issue. But what about the ArrayList<String> tags parameter? Passing this to our public API is no problem, but when we implement the public API, how will we pass this ArrayList to our native interface, since native interfaces don’t allow us to arrays of strings as parameters? Encode the parameter as either a single String (e.g. using JSON or some other easily parseable format) or a byte array (in some known format that can easily be parsed in native code). Store the parameter on the Codename One side and pass some ID or token that can be used on the native side to retrieve the value. If the data structure can be expressed as a finite number of primitive values, then simply design the native interface method to take the individual values as parameters instead of a single object. E.g. If there is a User class with properties name and phoneNumber, the native interface can just have name and phoneNumber parameters rather than a single `user parameter. In this case, because an array of strings is such a simple data structure, I decided to use a variation on strategy number 1: Merge the array into a single string with a delimiter. In any case, we don’t have to come up with the specifics right now, as we are still on the public API, but it will pay dividends later if we think this through ahead of time. It is quite often the case that native code needs to call back into Codename One code when an event occurs. This may be connected directly to an API method call (e.g. as the result of an asynchronous method invocation), or due to something initiated by the operating system or the native SDK on its own (e.g. a push notification, a location event, etc..). Native code will have access to both the Codename One API and any native APIs in your app, but on some platforms, accessing the Codename One API may be a little tricky. E.g. on iOS you’ll be calling from Objective-C back into Java which requires knowledge of Codename One’s java-to-objective C conversion process. In general, I have found that the easiest way to facilitate callbacks is to provide abstractions that involve static java methods (in Codename One space) that accept and return primitive types. //This method is called once the unread updates count is available. I.e. If we were to implement this method (which I plan to do), we need to have a way for the native code to call the callback.onResult() method of the passed parameter. How to pass the callback object through the native interface. How to call the callback.onResult() method from native code at the right time. For the first issue, we’ll use strategy #2 that we mentioned previously: (Store the parameter on the Codename One side and pass some ID or token that can be used on the native side to retrieve the value). For the second issue, we’ll create a static method that can take the token generated to solve the first issue, and call the stored callback object’s onResult() method. We abstract both sides of this process using the MobihelpNativeCallback class. This class uses a static Map<Integer,UnreadUpdatesCallback> member to keep track of all callbacks, mapping a unique integer ID to each callback. The registerUnreadUpdatesCallback() method takes an UnreadUpdatesCallback object, places it in the callbacks map, and returns the integer token that can be used to fire the callback later. This method would be called by the public API inside the getUnreadCountAsync() method implementation to convert the callback into an integer, which can then be passed to the native API. The fireUnreadUpdatesCallback() method would be called later from native code. Its first parameter is the token for the callback to call. We wrap the onResult() call inside a Display.callSerially() invocation to ensure that the callback is called on the EDT. This is a general convention that is used throughout Codename One, and you’d be well-advised to follow it. Event handlers should be run on the EDT unless there is a good reason not to - and in that case your documentation and naming conventions should make this clear to avoid accidentally stepping into multithreading hell! Most Native SDKs include some sort of initialization method where you pass your developer and application credentials to the API. When I filled in FreshDesk’s web-based form to create a new application, it generated an application ID, an app "secret", and a "domain". The SDK requires me to pass all three of these values to its init() method via the MobihelpConfig class. Note, however, that FreshDesk (and most other service provides that have native SDKs) requires me to create different Apps for each platform. This means that my App ID and App secret will be different on iOS than they will be on Android. Therefore our public API needs to enable us to provide multiple credentials in the same app, and our API needs to know to use the correct credentials depending on the device that the app is running on. //Attach the given custom data (key-value pair) to the conversations/tickets. //Attach the given custom data (key-value pair) to the conversations/tickets with the ability to flag sensitive data. //Retrieve the number of unread items across all the conversations for the user synchronously i.e. //Initialize the Mobihelp support section with necessary app configuration. //Attaches the given text as a breadcrumb to the conversations/tickets. //Set the name of the user to be reported on the Freshdesk Portal. //Directly launch Feedback Screen from anywhere within the application. //Displays the Support landing page (Solution Article List Activity) where only solutions tagged with the given tags are displayed. //Displays the Integrated Support landing page where only solutions tagged with the given tags are displayed. The final native interface is nearly identical to our public API, except in cases where the public API included non-primitive parameters. Notice also, that the native interface includes a set of methods with names prefixed with config__. This is just a naming conventions I used to identify methods that map to the MobihelpConfig class. I could have used a separate native interface for these, but decided to keep all the native stuff in one class for simplicity and maintainability. The initAndroid() and initIOS() methods include a check to see if they are running on the correct platform. Ultimately they both call init(). 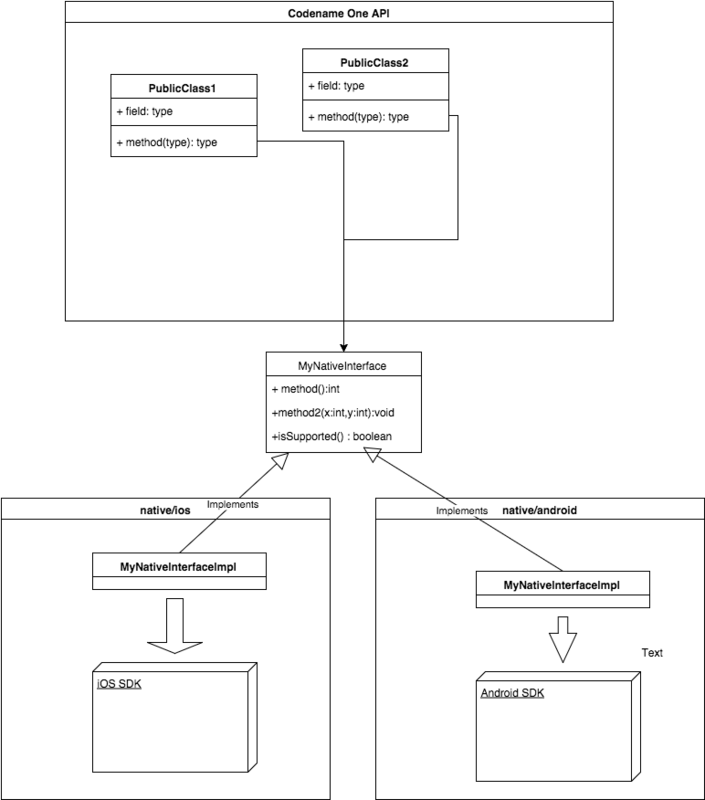 The init() method, uses the NativeLookup class to instantiate our native interface. For some other methods, the public API needs to break apart the parameters into a form that the native interface can accept. E.g. the init() method, shown above, takes a MobihelpConfig object as a parameter, but it passed the properties of the config object individually into the native interface. In part 2 of this series I’ll cover the native Android implementation, and part 3 will cover the native iOS implementation.